Custards are a special comfort food that kind of fell off our collective radar in the last 30 -40 years, but they really deserve a place at the table. Eaten warm on cold, rainy or snow-slushy days, or room temperature, even chilled with fresh fruits in warm, sunny weather, they offer us a sense of well-being. What I love about Maple Vanilla Custard is the symbiosis of these two flavors as they play off each other. Maple syrup brings a delicate, almost woodsy sweetness that is complemented by the more complex flavor profile of pure vanilla. The magic happens when the flavors explode on the palate and tongue. Worries fall away, the awfulness of a sore throat eases, and for a few minutes all’s well with the world. 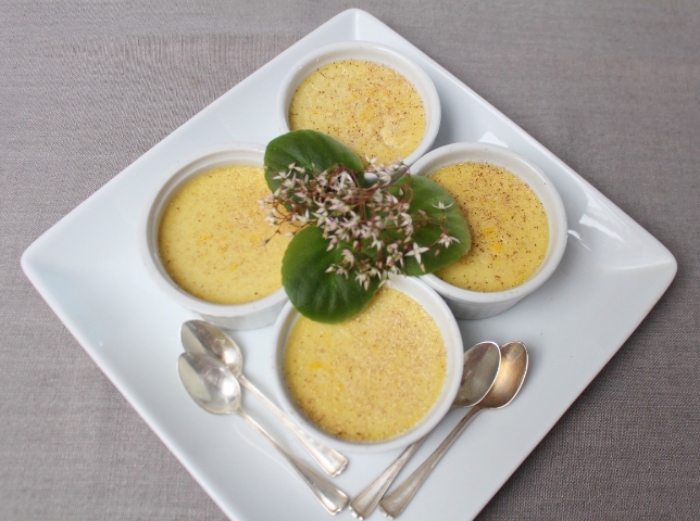 Recently I made Creme Anglaise to go with David Lebovitz’s recipe for Apricot Souffles. Normally I use heavy cream (double cream) to accompany a rich dessert or I whip the cream and flavor it with vanilla, but I rarely think Creme Anglaise. However, when I made it for the souffles it was like re-connecting with an old friend. I realized how perfect it is on so many things — fresh or dried fruit compotes, slices of warm cake or pie, fresh berries, even adding its creamy deliciousness over French Toast. In England it is nearly always offered with with “puddings,” which really means what we Americans call cakes, and David Lebovitz uses it to accompany not only the light Apricot Souffle but also with his dense, rich Chocolate Souffle. There are a lot of reasons to like David Lebovitz because he’s a genuine, funny and considerate person. He also happens to be a really good chef! And, he has been generous with sharing a fair number of recipes posted on my site, which I truly appreciate. Let Them Eat Cake Pudding! It’s the end of the holiday season. You’re cleaning out the refrigerator and discover a big chunk of stale pound cake wrapped in foil. Or, there’s the nut cake you were gifted; you’ve meant to serve it before now but it’s gotten too dry. No need to waste what you’ve already got as stale cake just begs for new life! 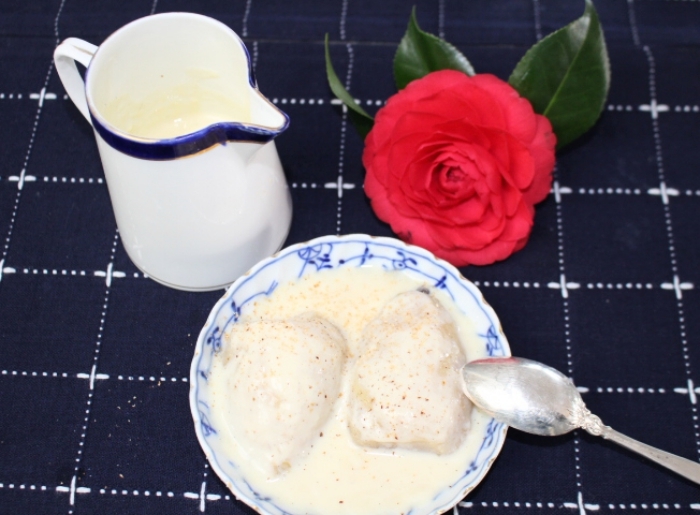 This is a little different from traditional Fool recipes, which are made with minced or pureed fruits and whipped cream or custard. This recipe has cooked rhubarb and strawberries, whipped cream blended with crème fraiche and delicate rose water. You are welcome to substitute other fruits for the strawberries and rhubarb if you choose. Just keep the proportions more or less the same. David Lebovitz is a master dessert maker and a good instructor as well. Although his recipe didn’t include vanilla, a little bit can only enhance the coffee and cream. The natural sweetness of the port is enough for this light dish, and the frozen sour cherries are perfect when fresh fruit is not available. This is, hands down, the best panna cotta I’ve ever tasted. I suspect that the buttermilk plays a starring role as it provides a delicately tart undertaste. I have to say, I have never ordered a second dessert at a restaurant before, but my friend ate part of mine so, when he went to the rest room, I ordered a second one! Fortunately, he found this amusing. Recently I had dessert in a lovely café near where I live. One of their signature desserts is a lemon pudding that tastes as if it may have a cream cheese base. It was so good that I decided to go home and experiment. 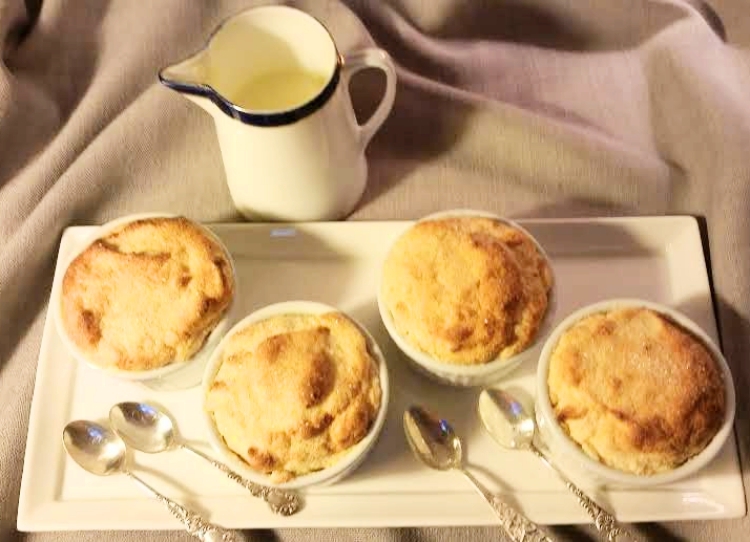 Carol’s recipe is based on the classic, Blancmange, a sweet pudding made from milk and thickened with cornstarch, gelatin or other thickener. In the late 1800s/early 1900s, this was a food given to people who were ill to build back their strength. As we had no antibiotics, food was critically important. This is a nice treat for kids when their braces get tightened or when they’re home with the flu. Feel free to use extract if you prefer though the vanilla bean does impart a lovely flavor. David says that this is not so much pudding consistency, but more like sticky rice. If you would like it thinner, add 1/2 cup or so more coconut milk. Chocolate that is smooth and rich in flavor is ideal for using in mousse. You can use either milk or dark chocolate, but if you use milk, make certain that it is at least 35% cacao. What’s special about this recipe is that it’s cooked. Most mousses are not cooked, which can be a problem for anyone with a compromised immune system. While cooking adds an extra step, you don’t need to be concerned about using eggs. Note: This is a multi-level project. It’s not difficult, but it is time-consuming. It’s also impressive and delicious. It comes with the additional recipe for lady-fingers. These delicate sponge-cake treats are useful for tiramisu, chocolate mousse cake and other specialties. Although Tony didn’t indicate his recipe should be made this way, you could line an 8- or 9-inch spring-form pan with the lady-finger batter, then, after batter is baked, fill the pan with the pumpkin mousse. This method is less time-consuming yet maintains the beautiful flavor palette of the recipe. Decorated, it will have a dramatic presentation as well. This is a very popular dessert as most of us love the rich and homey taste and texture of custard. The warm crunchy sugar crust, in contrast with the silken cold custard makes each bite a total sensory pleasure. Serve just as it is or with fresh berries on top. Note: You may substitute 2 teaspoons of Rain’s Choice vanilla paste instead of the bean, vanilla bean powder and extract. Eliminate the bean, powder and extract and add vanilla bean paste to the cooled custard mixture before baking. So, here’s what David has to say about White Chocolate Custard with Raspberries: I serve these custards slightly warm, which softens the raspberries and releases their subtle, sweet perfume. Savor these with tiny, delicate silver spoons; something as dreamy and elegant as these quivering custards, with their creamy-smooth white chocolate demands to be relished in small, measured doses.